Staring into the camera, floating high above the Earth, astronaut Buzz Aldrin must have been over the Moon with this incredible shot – the first ever selfie in space. He took the snap in 1966, on the Gemini 12 mission to test vital equipment. The archive covers Nasa’s space programme from its very first beginnings in the late 1940s through to the triumphant moon landing of 1969 and beyond. 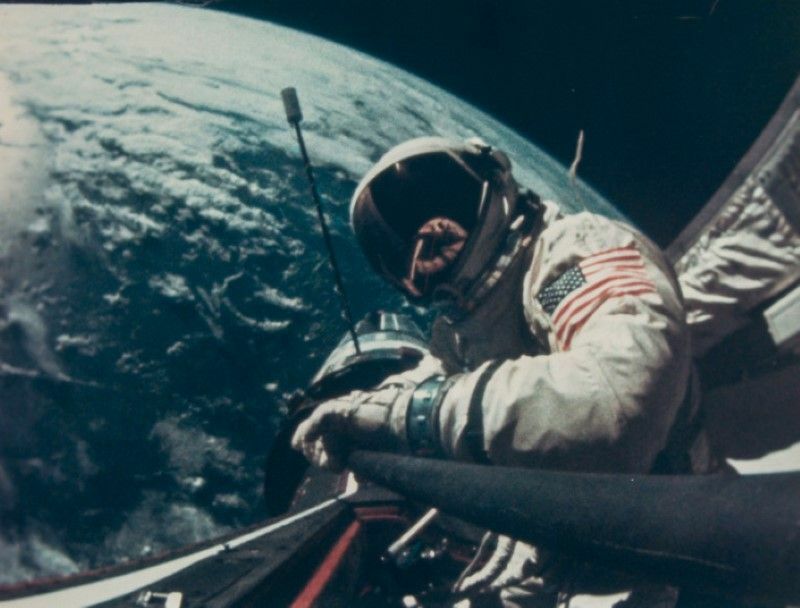 Another highlight is a ‘selfie’ taken by legendary astronaut Buzz Aldrin on the Gemini 12 mission of 1966. Aldrin, the mission pilot, took the shot of himself looking back towards Earth, unbeknownst that he was almost 50 years ahead of the trend. The only known-of photo of Neil Armstrong’s historic first steps on the Moon also features in the archive, as does an iconic 1972 shot of Apollo 17’s Harrison ‘Jack’ Schmitt on the Moon with the Stars and Stripes in the foreground and Earth in the distance. The pictures taken by John Glenn, the first astronaut to take a camera into space, and an album of shots of Ed White performing his 1965 spacewalk, the first by an American, are in the collection too. Many of the photos remained unseen in the vaults at Nasa until the late 1980s when they were discovered by archivists. This is the only clear photograph of Neil Armstrong on the Moon, during the Apollo 11 mission in July 1969. This is the first photograph ever taken of Earth from space, stitched together by engineer Clyde Holliday from a V2 rocket, on 24 October 1946. One of the stars of the collection is the first ever photo of Earth from space, which was taken on a camera mounted on a rocket in 1946 that was blasted 65 miles above the atmosphere. The camera snapped away at one frame every 1.5 seconds before the rocket plummeted back to Earth. The camera smashed on impact but the film role was salvaged and developed. The resulting grainy black and white photographs were stitched together to make one shot – and it changed man’s relationship with space forever. The curvature of Earth is seen from the orbiting spacecraft Gemini 11 in September 1966. Time-exposure of the Gemini 10 launch on 18 July 1966. A view of the giant Saturn V rocket ahead of the launch of Apollo 4 on 9 November 1967, on the pad at dawn with the moon in the background. This photo by astronaut Richard Gordon on the Gemini 11 mission in September 1966 shows Libya, United Arab Republic and Sudan from space, looking a bit more like Mars than Earth. This photo by astronaut James McDivitt shows the first US Spacewalk, by Ed White over South California, during the Gemini 4 on 3 June 1965. Buzz Aldrin’s boot in lunar soil, during the Apollo 11 mission in July 1969. Astronaut James Irwin’s 360-degree panoramic view with David Scott and one of the Apollo rovers is seen beside Hadley Rille, Station 9A on the lunar surface during Apollo 15 in August 1971. This eclipse of the sun by Earth was taken during the Apollo 12 mission November 1969. An image from Ed White’s personal photograph album of the Gemini 4 mission, June 1965. Buzz Aldrin prior to becoming second human being to set foot upon the Moon during Apollo 11. This photo by astronaut James McDivitt of the first US spacewalk again shows Ed White. This image taken by astronaut Al Worden is an orbital panorama of the Humboldt Crater, during Apollo 15, in August 1971. A photo by astronaut Edgar Mitchell shows Alan Shepard and the American flag on the Apollo 14 mission in February 1971. Alan Bean is seen with the reflection of the photographer, Pete Conrad, while holding a sample capsule during the Apollo 12 mission in November 1969. The images also show the difficulties of shooting in space — many are overexposed or suffer from light leaks, something rarely seen in the glossy photographs Nasa releases today. All the images are Nasa originals, bearing their unique stamp, caption and identification number.